CO2 laser cutter VS fiber laser cutter, which one do you prefer? Adjusting the settings on a CO2 cutting laser varies the quality and finish of the cut, i.e., making it coarser or finer. You can reduce the power for thinner or less robust materials, as well as slow the cutting speed to prevent burning at the edges of cuts. Because the cutting beam focuses to a pinpoint, there is far less kerf than you would get with a standard steel blade. While the kerf is minimal, it is still wise to leave a couple of millimeters spare between the parts while marking them on the sheet. Vector engraving – the laser beam engraves an outline. Raster engraving – the laser ‘prints’ an infill engraving. CO2 laser cutting can be used to cut or engrave materials as diverse as paper, plywood, and acrylics. In fact, CO2 laser cutting stainless steel is very prominent in the fabrication industry. Metals are worked using industrial-sized CO2 cutting lasers. CO2 laser cutting allows a quick turnover of bespoke design parts at very low cost. Prototype parts can be produced, tested, and turned over for high-volume manufacturing, in the space of a day. CO2 laser cutting is an indispensable manufacturing process for most fabrication jobs. Contact one of our representatives to learn more about our laser cutting process. 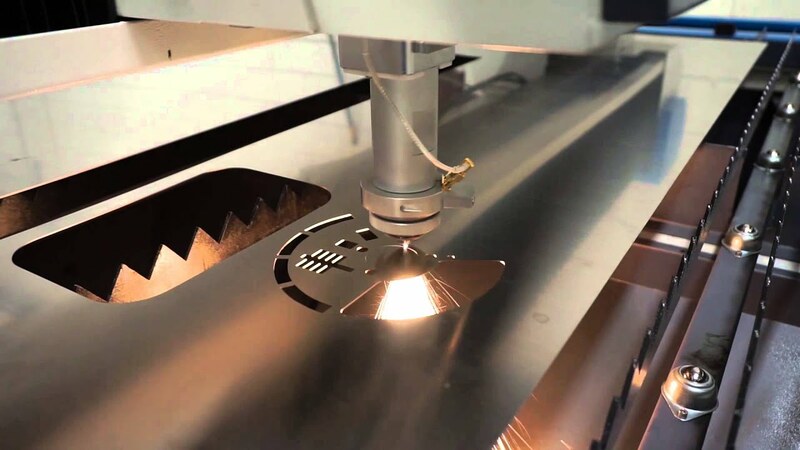 Why Fiber Laser Cutting Machines are Here to Stay? Fiber lasers are easy to use and very reliable, with minimal overhead. There are no expensive mirrors and lenses to set up and maintain. In fact, the fiber laser cutting machine is almost maintenance-free. They are also more optically and electrically efficient. Not only does this mean that most of the power generated goes into cutting the metal, but less gets converted into waste heat. Consequently, less water cooling is required. A fiber laser consists of up to 80% of its power input, a much higher efficiency than either gas or crystal lasers. Many industry sectors are now switching to fiber laser cutting because of the faster processing times it offers. New fiber laser metal cutting machines are combining ever higher power output with reductions in energy input. This is leading to cheaper commercial runs and prototyping. Speak to one of our team members to learn more about our fiber laser cutting technique. CO2 laser cutter VS fiber laser cutter, which one do you prefer?Feel free to leave a comment below. Due to the rapid development of society, metal appeared in people’s life with increasing frequency, jewelry, ornaments, building materials, such as showing a shortage situation and market demand is still in continuing to rise. Today, we are going to introduce the advantages of fiber laser cutter in metal field. 1. Fiber laser metal cutter adopts imported fiber laser, high profile cutting head, high precision rotary servo motor, with professional laser cutting control software, supporting automatic follow the focus system. 2. Fiber laser metal cutter can automatically follow the bending of the work piece, automatically adjust the focus position, to ensure the precision of cutting. 3. Fiber laser metal cutter can be matching automatic feed cutting system for bracelets, rings, pipes and other annular work piece rotation cutting, perfect fit the work piece surface and special angle. 1. No laser working gas, optical fiber transmission, no reflection lens, can save a lot of maintenance costs. 2. Cutting precision is high, the speed is quick, the slit is narrow, the heat affected zone is tiny, the cutting surface is smooth without burr. 3. The life of fiber laser can reach up to 100 thousand hours. Price, Quality and Service: Which Factor You Care Most When Buying a Fiber Laser Cutter? When you want to buy fiber laser cutting machine, which factor you care most? The price? Or the quality? Or service? From our 15 years’ export experience, they are all same important. Price: Many customers always want the best quality with the lowest price. As a business man, we want to get more profit. But we also should remember a words: ”What price, what products”. You can always get some lower price from some suppliers in China Market. There is no lowest price in China at all, there is only much lower price one by one. If other suppliers can give you an offer which is even lower than the cost, what will you think about it? As a very wise business man, when you are purchasing something, you will not only consider the price, but also you will consider the cost when you are using these purchased products. Quality: No matter you are the final user or not, quality is very important. If you are the final user, high quality with high features machine will can save your work time and amend cost, bring you more profit. If you are the distributor, you will get more and more customers, because you always supply them with best products. Steel tubes and plates are welded together bed structure is better than only steel tubes welding or plates welding. It will be more stable and higher precision. Aluminum gantry is better than traditional iron gantry. It has better stability, faster cutting speed and higher cutting precision. We adopt world famous brand Germany IPG, America Nlight laser generator, global warranty. Service: We can’t ignore it, especially for the high value fiber laser cutting machine. As a customer, if your machine doesn’t work, the supplier don’t help you solve the problems, at the same time, there are many jobs waiting for you to do for your customers, how is your feeling? Urgent! Upset! How is the result? You will must spend much money to amend it or change the parts, it not only delay your work, but also has a bad effect for your markets. So, If you want to buy the high quality machine with best price and great service, please contact us freely. If there is any products below grade, we promise that if you want to return the machine, we will accept without any delay.